I always find black and white combinations a bit stark on me… but am realizing that the contrast can be softened with pretty patterns, intricate designs, and soft textures. Oh, and the “pin”? Clip on earring. Yep. Works incredibly! Moving update: we are in the middle of our move currently (at a rest stop right now) and should be in Baltimore soon! Likely won’t have internet there for a bit which is why I’m making this post now. Also, a few of you asked… no, we did not live out of boxes for 2 months because we had so much stuff to pack! We actually have very little, as we were living in a studio apartment and are currently driving ourselves cross country in a teeny moving van. However, for our last two months in Chicago, we were apartment sitting, so therefore had to pack up everything for the move beforehand! Thank you all for your well wishes! Love the softened look. Hatzlacha in Baltimore. Lived there for several years. Several She’arim people there too. Let me know if you need connections. The black and white is lovely. I did a look similar to this for work today with light grey instead of white and ended it in a long braid. And welcome to the east coast we are going to be close neighbours now! Like by 4 hours but if you do any work shops I will be able to swing by now! Yay! Beautiful Andrea! It looks lovely on you. 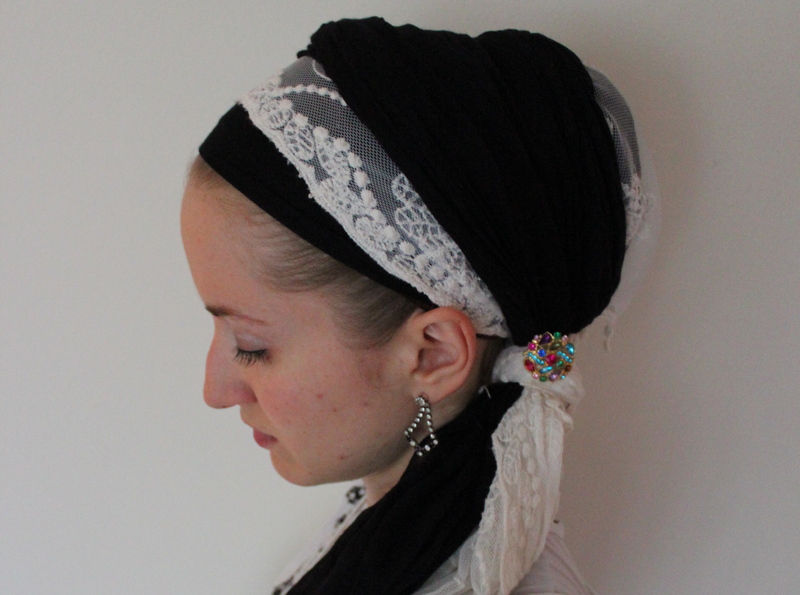 Where did you find the delicate lace tichel? I can hardly wait until you begin to sell tichels…you find such pretty ones! I too think the lace does a great job of softening up the black and white, and I’m totally enthralled by the clip-on earring. Next time I’m at my parents’ house, it’s going to be time to rummage through the old dress-up jewelry…. I love what you did with black and white! I love black and white combinations, and the clip on earring tip is so neat – I would never have thought to do that!